Peter Goodfellow is a representational artist, widely exhibited & collected through the UK and Europe, who specializes in landscapes and portraits. 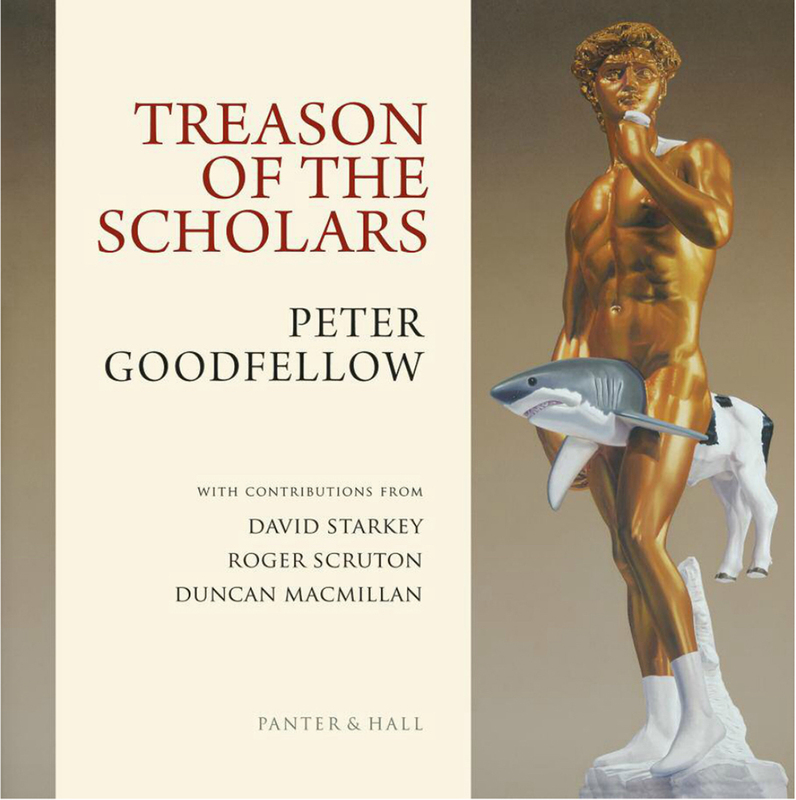 He runs The Lost Gallery in Scotland, figured in the 2012 BP Award, and has recently taken the battle for aesthetic integrity to the art establishment by means of an exhibition at Panter & Hall, and a book, both entitled Treason of the scholars. The Frame Blog: A great many people will salute your crusade against the emptiness of conceptual art; how long have this exhibition and the accompanying book been brewing? What was the catalyst? Peter Goodfellow: Over the years I had watched from my bolthole in the Cairngorm Mountains the shenanigans of the Hirst–Emin–YBA–conceptual phenomena, and I was waiting for the media, curators and academics to say ENOUGH is ENOUGH: let’s get back to sanity. But then I read Brian Sewell ’s Naked emperors (which, in addition to being a serious critique, is extremely funny), and realised that it was too late, and the art establishment had been completely taken over by a coterie of self-seeking administrators, curators, and artists’ PR machines, which now controlled the Tate, the Royal Academy, the Arts Council, the British Council, the Hayward Gallery, etc, and – worryingly – every regional art gallery in Britain. My epiphany came in 2009 when I was in Venice, and I realized – surrounded by one of the greatest achievements of western civilization – that, unlike our predecessors, our culture was leaving behind virtually nothing of visual worth to future generations; and so I started planning this exhibition. FB: You have some weighty contributors to the book, including Roger Scruton and David Starkey. How did this collaboration come about? PG: I was at a private view of a show at the Mall Galleries of the Society of Portrait Painters, and my portrait, The legacy of Joseph Beuys, was highly praised by David Starkey. I put my idea to him, and he completely agreed with the philosophy, but warned me just what I was up against. Roger Scruton’s essays already existed as broadcasts on Radio 4’s Points of view, and he just agreed immediately to let me use them. Duncan Macmillan is a highly respected Scottish art historian and art critic for The Scotsman, and has long been a campaigner against the hegemony of the Tate-Turner Prize axis. FB: A quality which is immediately remarkable about the work in this exhibition, after the wit with which you skewer the likes of Tracy Emin, Damien Hirst and the curators who promote their output, is the technical skill behind it. Where did you train, and how would you summarize your career? PG: In 1968 I did an illustration course at Central St Martin’s. I had intended to do fine art, but my lecturers told me that there was no future there unless you intended to teach. Pretty much straight after leaving college I started getting commissions for book jackets from Penguin and other publishers, and I had a very high profile and successful career in illustration for 25 years. I view that time as one of honing my imaginative and technical skills – very useful now. In 1994 I became a full-time painter, and explored various avenues before settling on expressionist landscape painting in 2004. However, that style would be of no use to express the sentiments of this show. I do enjoy painting in both, very different, styles – one is free and energetic, the other is intellectual and controlled. FB: One very noticeable feature of your exhibition is the use you make of picture frames. Are they symbolic – ironic – a way of emphasizing the point? PG: They are both. The carved plaster niches are copies of Renaissance altarpiece frames, and as I’ve always loved Fra Angelico’s paintings, it was a way of indicating my interest in early art at the same time that I was satirizing our worship of consumerism. PG: It always depends on the painting. There are three large box canvases in this show that do not have frames, because framing them would detract from the almost abstract graphic simplicity of the images (Totem fragment, Cup Cake Max I and II). But I think that most of the others have a certain rich, jewel-like quality which is emphasized by the gilded carved frames. I am also satirizing the kitsch nature of many of the artists I am criticizing by adding some ‘bling’. FB: Where do the frames come from? Are they off the peg (so to speak), or did you design – or even make – them? PG: I am constantly on the look-out for frames, and it may be years before I find a use for one I have – where the size is appropriate for the image I want to paint. If money were no object I would go even further, but usually I have to adapt what already exists. An exception is the frame on Omen III, which I had made – at a cost of £2500. In the case of the niches, they are made of plaster, so I was able to hand-carve them myself and then gild them. They are very fragile, which is why they are displayed in perspex boxes. FB: Some at least of them are frames which you’ve acquired and altered, aren’t they? 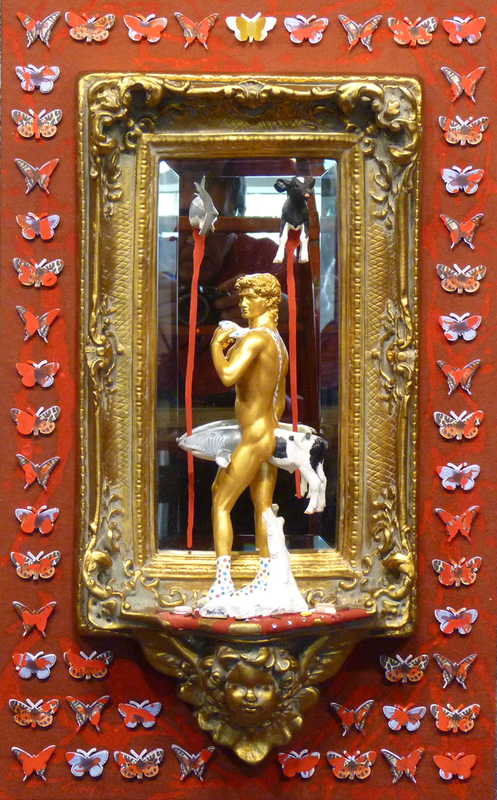 The tall narrow frame used in Omen resurrection, a work which brings Michelangelo’s David together with many of Hirst’s best-known motifs, looks like a common or garden chocolate-box compo frame, which has been translated in a higher cause, and supplied with a pig-eared putto and an outer frame of Hirst-like butterflies. PG: You are correct. It is fibreglass, and as soon as I saw it in one of those ‘shabby chic’ shops I had the idea for this three- dimensional piece. It came from the camp and kitsch nature of the frame itself, and of course the mirror allowed me a dig at the narcissistic tendencies of many of the artists I’m criticizing. FB: I also suspect the frame of Top dog of an earlier incarnation as a looking-glass – this might add another dimension of irony, if it were indicated! 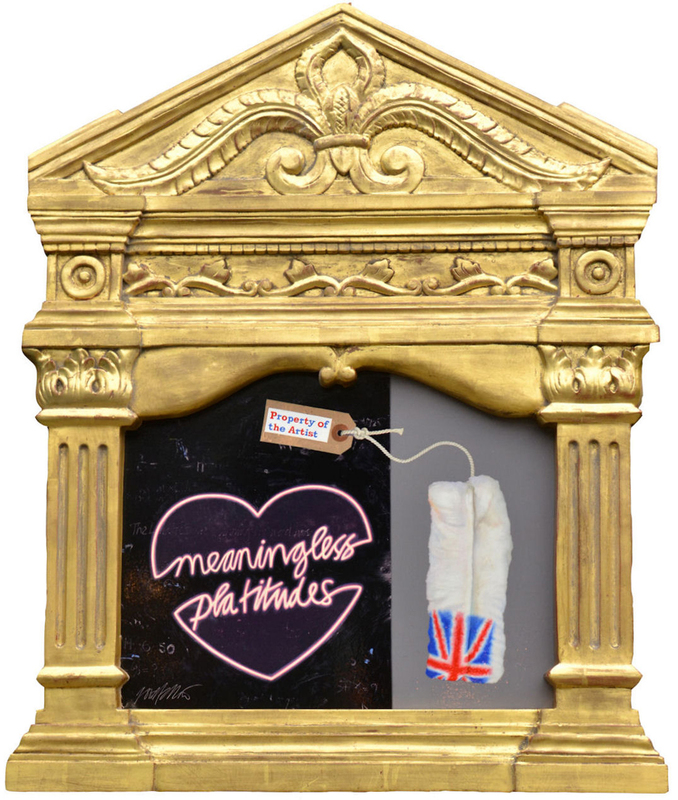 PG: Right again – it’s a mirror for a mantelpiece, and not my usual 15th century style but a French Empire frame – very appropriate for Koons and the other brands on show in the painting. 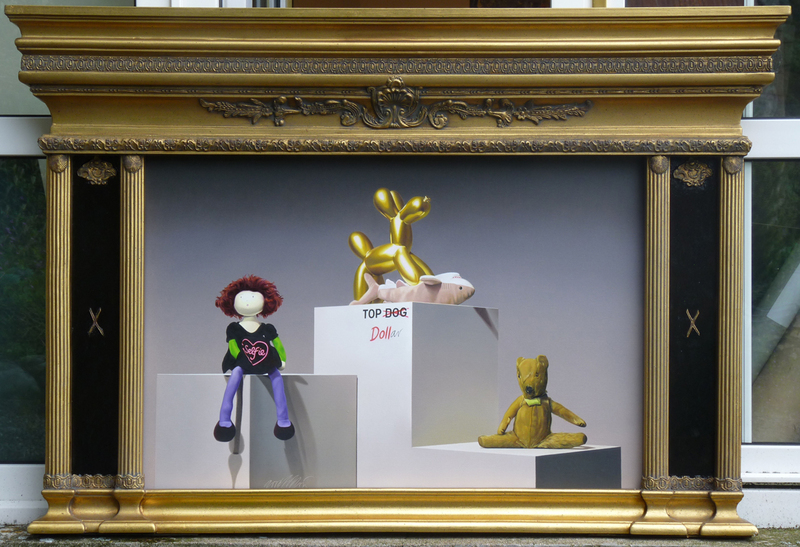 Teddy (my own bear) represents Grayson Perry, who – although he has traditional skills at his core – has now become a brand himself. FB: The little round-arched tabernacle frames with the bracket-like apron at the base are used in a way that 14th and 15th century framemakers would recognize, with inscriptions which expand on the meaning of the paintings they contain, and symbols and motifs which support them. Is this fortuitous – a function of how you are using these frames – or are you deliberately harking back to the inscriptions and painted symbols on mediaeval and Renaissance altarpieces? PG: I am parodying them, if you like. 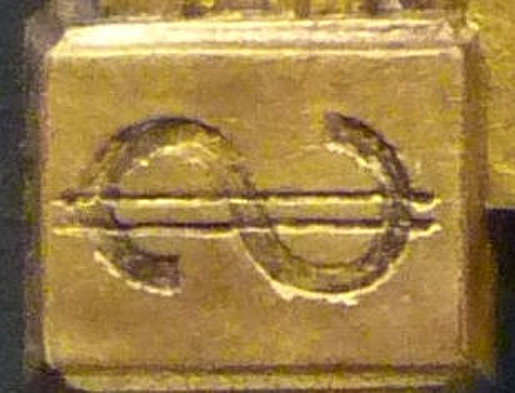 My carved symbols on the Rhine maidens are various international signs for currency (in Wagner’s opera Das Rheingold, the Maidens guarded the Rhine gold, and the dwarf Alberich steals it, and makes it into the magic Ring which can rule the world). 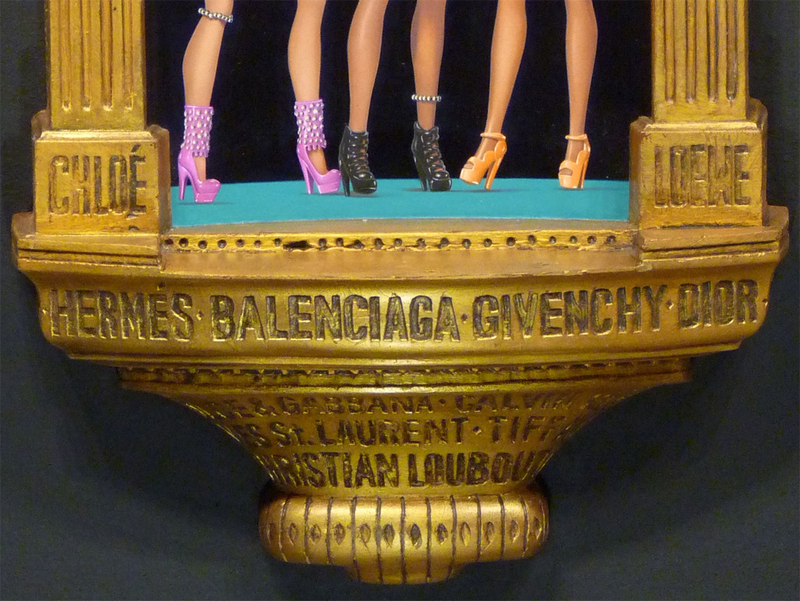 The designer brand names on The III Graces reflect our obsession with labels, which have become a new religion. 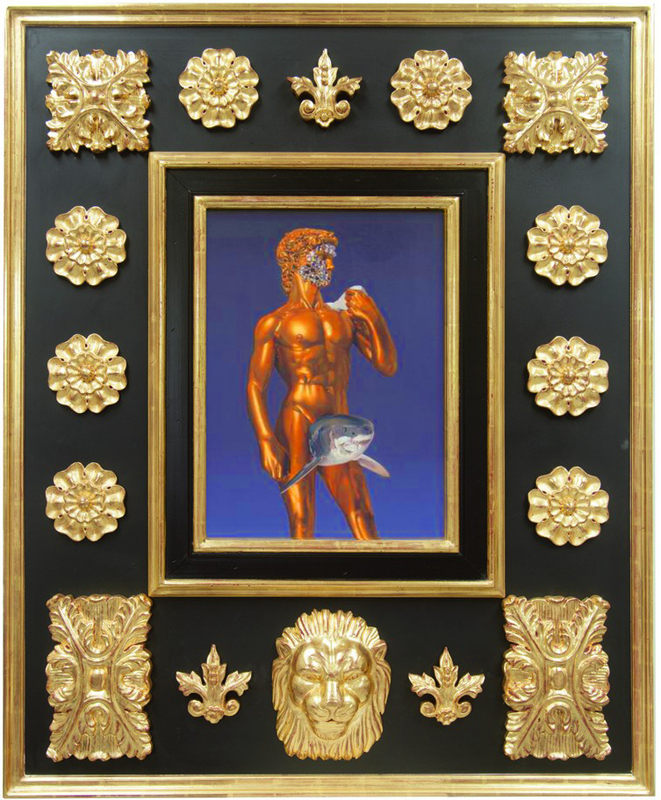 My Rebirth of Venus escapes this satirical touch; on this frame – which is the same arched pattern – I’ve just carved molluscs and sea shells. You might say that I have always been fascinated by hidden meanings in paintings, and even though I think I am being quite literal, allegory and symbolism escapes most people. FB: How did you produce the inscribed names on The III Graces? They are, satisfyingly, such an integral element of the work. PG: I use scalpels, watchmakers’ tools, and small wood chisels. If you moisten the plaster as you are working on it you can actually ‘draw’ the carved lines. 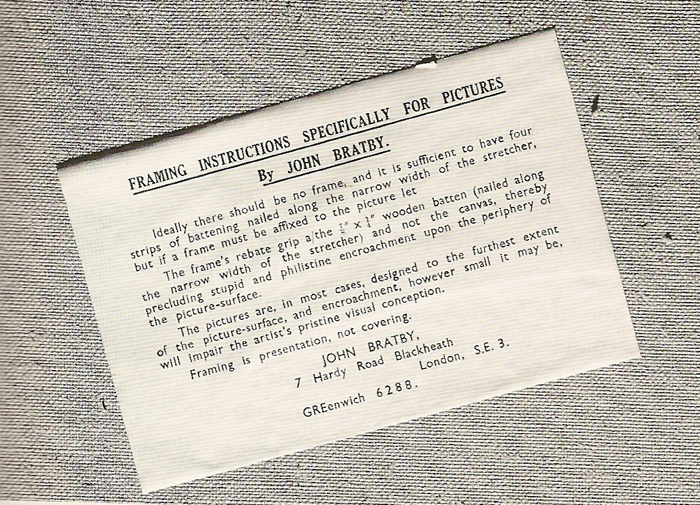 FB: Have you used antique or custom-made frames before this particular exhibition on your work? 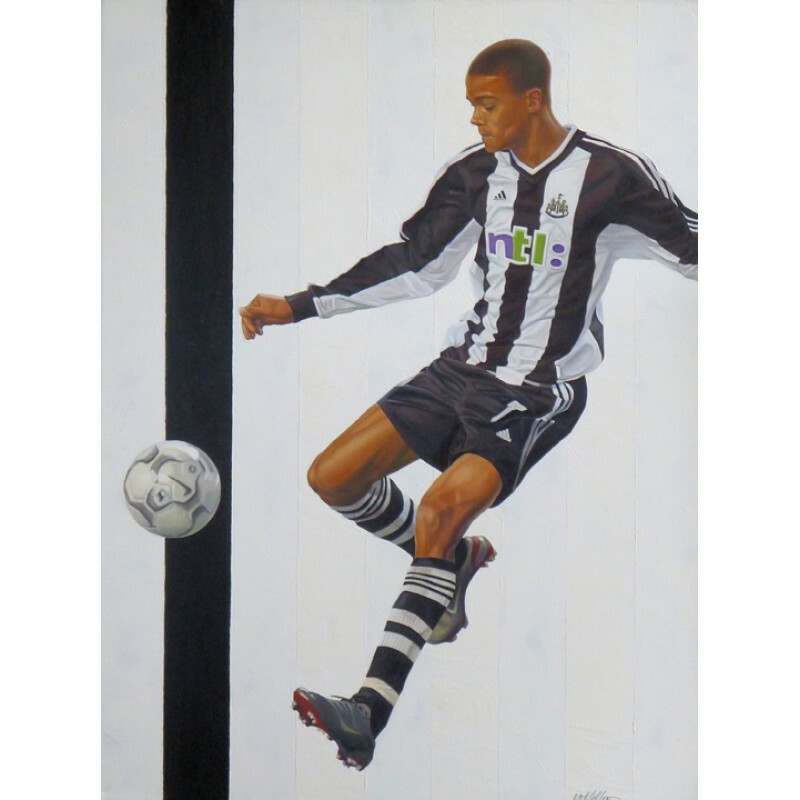 How do you frame your figural paintings, of footballers and politicians? PG: Yes, I have; even with some of my smaller landscape paintings. They can look equally good in an antique or modern frame – it depends on the surrounding ambiance of the room; i.e. ultra-modern environments usually need minimalist solutions, while cosy cluttered rooms will take more ornate frames. I do not frame the box canvas footballer paintings as they have a poster-like feel to them. FB: I wondered whether you were aware of the work of Mark Ryden? 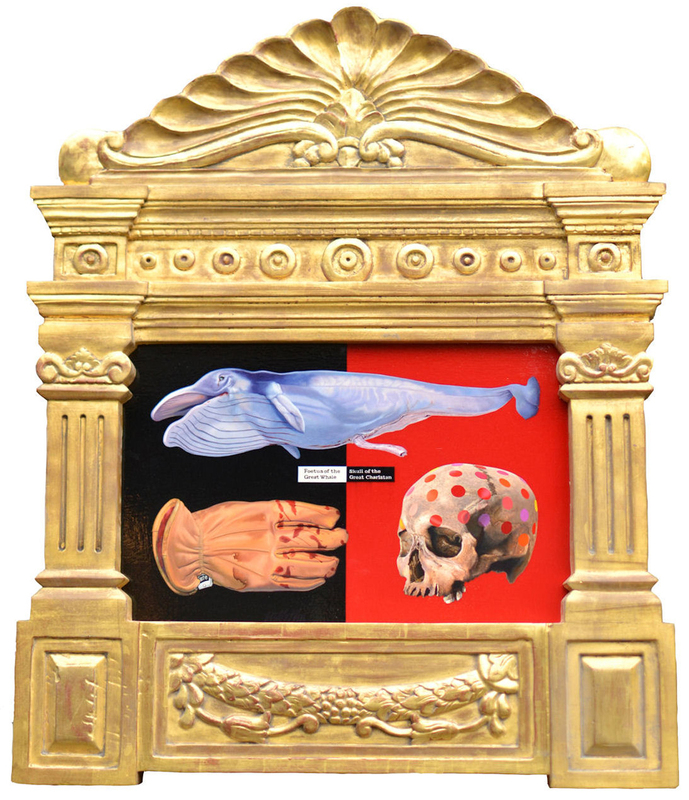 He’s an American representational artist with a surreal, gothic imagination, and a penchant for frames that he has carved by hand – mainly in the far East – to suit the individual painting. Perhaps artists are beginning to edge back into a realization of what a frame – and the expectation that frame raises – may add to a picture… Will you use frames again in the future, with a weighted or targeted emphasis? PG: I like his idea of individually carved frames to suite each image, but note that he has to have them realized in Asia because of the cost. It’s nearly always down to cost, but I will continue the bespoke route for certain images. On straight portraits, I like a hand-gilded finish to the frame, but I think that most artists frame their paintings as cheaply as possible. I have used two frames in this particular exhibition which look like the real McCoy but are in fact fibreglass – Omen, and Omen II. That could be a possible solution. However, in an ideal world (money no object) it would be nice to go to Florence and tour the artisan backstreets and have everything custom-carved. P G: In conclusion, I would like to stress that my tirade against the current art establishment comes from a deeply-held belief that art is not to be taken lightly: it has to be grafted and worked hard for, and isn’t something which just appears on a whim. So much conceptual art is lazy and easy and intellectually weak, but self-seeking curators have shrouded the whole phenomenon in what Duncan Macmillan calls ‘international art English obfuscation’. The whole point about the ‘visual arts’ is that they have to work VISUALLY, and I have no truck with the subjective-objective argument, because if art historians did not judge art objectively the cream of the past would not have risen to the top. With thanks to Peter Goodfellow for his time, and for all the images. Fascinating interview! Thanks for sharing it.